August means it’s “Peach Strike Season!” What is this annual Bibliopharm event? It’s the time of year when my daughter is so sick of seasonal harvest that she simply refuses to eat another peach, tomato, zucchini, etc. So when faced with More-Ripe-Whatever-Than-I-Know-What-To-Do-With I’m looking for options my family might just eat and dessert is always a winner. 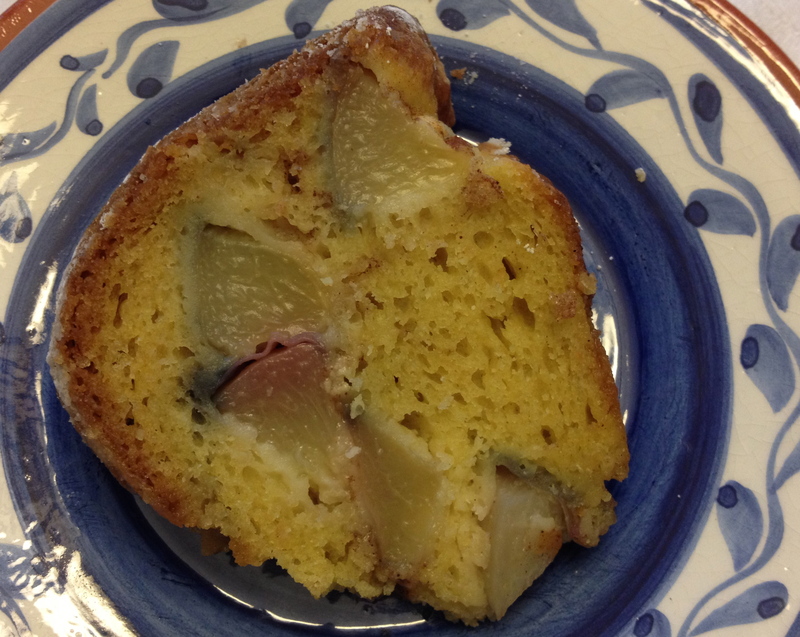 This recipe was inspired by Ina Garten’s Fresh Peach Cake. Cream the butter and sugar for 3 to 5 minutes on medium-high speed, until light and fluffy. With the mixer on low, add the eggs, one at a time, then the sour cream and vanilla, and mix until the batter is smooth. In a separate bowl, sift together the flour, baking soda, baking powder, and salt. With the mixer on low, slowly add the dry ingredients to the batter and mix just until combined. Fold in the peach-flour mixture. Spread half of the batter evenly in the pan and sprinkle with the cinnamon-sugar mixture. Spread the remaining batter on top and marble by running a knife in a swirling motion through the batter. Bake the cake for 45 to 55 minutes, until a toothpick inserted in the center comes out clean. Let rest for 10 minutes and then de-Bundt. Serve warm or at room temperature. * This cake can get sticky and may be difficult to remove from the pan cleanly. If you’re counting on the picture perfect cake, make sure you butter and flour a non-stick bundt (I used a stoneware Bundt this time and some was left behind only to be pieced together and sprinkled with powdered sugar to help hide the cosmetic imperfection). You can also butter, flour, and use parchment paper in two bread loaf pans and utilize the paper like a sling and to lift out the cake. To make the cake less likely to stick, you can omit the cinnamon-sugar because when that caramelized goodness hits the pan it doesn’t want to let go. Yet another option is to go lighter on the peaches (the original recipe called for only three!) to provide the cake with greater structural stability. Of course, you could always just cut and serve it directly from the cooking vessel, in which case I would use either a nonreactive (i.e. Pyrex or Corningware–type glass) loaf or 9×13″ pan. Anyway, happy recipe tinkering!